OSWEGO, NY – The Oswego Lions Club with host the second annual Rivers Edge “handmade” Craft Show on June 9. 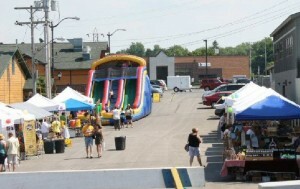 This year, the event will take place in a more spacious location right on the river’s edge, West Liner Park, in Oswego. Hours for the craft show will be from 10 a.m. to 4 p.m.
Take a walk through the many wonderful vendors at the Oswego Lions Club “Rivers Edge Craft Show.” Vendors are still welcome for this year’s show. Deadline is May 1. For more information call Denise Constanza at 315-591-1842 or Chris Pelton at 315-343-1394. There will be wine tasting by Americana Winery and many other fine food vendors. Anyone interested in being a craft vendor for the event, or if you are looking for more information, contact Denise Constanza at 315-591-1842 or Chris Pelton at 315-343-1394 or visit the Oswego Lions Club web site at http://eclubhouse.org/sites/oswegony/ or Oswego Lions Club Facebook page. Established in 1917, Lions International consists of 45,000 Lions clubs worldwide with a membership of 1.4 million volunteers. Local chapters of the club are committed to serving the disabled, including those with visual impairments, hearing loss and other handicaps. The funds raised from booth rentals will help support our administration fund so we can continue our efforts in serving individuals as well as organizations throughout our community. “With your help and support, we can make this event a huge success that will allow us to fulfill our mission and continue to provide services needed most in our community” said Constanza, show chairperson. We look forward to your attendance and support!